One of Deutsche Grammophon's most legendary recordings: Narciso Yepes' famous interpretation of Rodrigo's immortal Concierto de Aranjuez and Fantasía para un Gentilhombre from 1969, is one of the defining recordings of the Spanish classical guitar. Joaquin Rodrigo's music is among the most popular music of the 20th century. 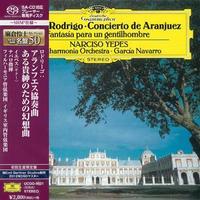 Concierto de Aranjuez is considered one of the pinnacles of Spanish music and of the guitar concerto repertoire.